This is a small painting I have been working on over the last few days. It is for a calendar and fundraiser auction for the Taranaki Womens Refuge. The theme was to be a Taranaki one and I felt that none of my so called "postcard" paintings - http://postcardfrompuniho.blogspot.com - were suitable. I'd been looking at this postcard reproduction of a rather famous and well known New Zealand painting by my friend and mentor Michael Smither, and I had the idea of doing a painting within a painting kind of thing. I stuck the postcard on my studio wall with bluetac, and put the old bottle with red pencil in front. 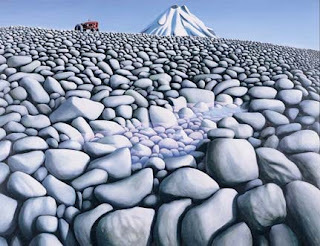 I've always liked the apparently incongruous, and almost surreal bright red tactor on the skyline, that contrasts so dramaticly with the cold grey Taranaki stones in Michaels painting, and I wanted the red pencil to echo that. The little Walt Disney figurine of Pluto, has already recently found it's way into my paintings. I like the humourous aspect of it, as though he is eagerly awaiting his walk on the beach. Or perhaps it's the faithful hound waiting at his master's feet...? Also, I've always found a slight Disneyish quality in Smither's colours and distinctive hard-edged and stylised forms. Michael Smither was one of the first real artists I ever met. He came to my very first exhibition I held in the Taranki Society of Arts Brougham Street Gallery in New Plymouth in 1976, and introduced himself, giving me lots of practicle advice and encouragement. For a while in the early 80's I shared studio space with him in King Street and I learned a great deal about painting from watching him working. Never having had the privilidge of going to any art school, I still regard this as the closest thing I've ever had to an art education. 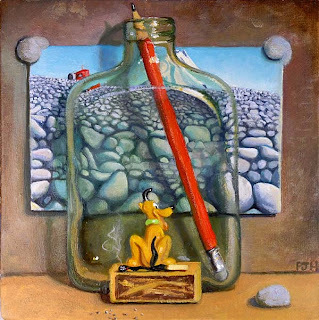 How fantastic, I love the composition .. as you say, Pluto looks as if he's just dying to go for a run along the beach .. I love the fact that you have incorporated elements from the Postcard from Puniho series .. the blu tack, match & matchbox, pencil, bottle & plastic toy .. brilliant! Thanks Heather! It was fun to do!